A new year has begun! And with it comes the promise of the spring festival season. These Passover youth and family activities might encourage you to study God’s word and create some meaningful and memorable moments. Here are some thoughts and resources to help you make it a special time of learning for the whole family. An excellent way to engage young and old in the biblical narratives, reader’s theatre provides an opportunity for everyone to participate in playing a role and gaining greater knowledge of the characters and events illuminated in the scriptures. Whether performed as a “play” or just enjoyed around the dining table, reader’s theatre could add to your celebration of God’s festivals. 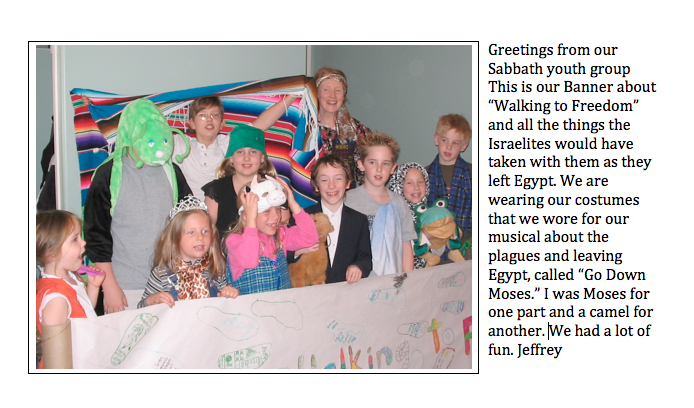 A humorous take on the biblical story of the ten plagues as recounted in the book of Exodus. A story for Passover that is often overlooked, but teaches important lessons for the season. What was it like to walk out of Egypt? Exciting? Scary? What were people thinking and feeling as they prepared for this incredible journey into the unknown? Create a banner to share your ideas. Why is this Night different from all other nights? As the Holy Day begins, here is a way to rehearse the events of that special night. A graphic organizer with questions and scriptural references to guide the discussion of comparing the Passover as observed by Israel, and the disciples of Jesus Christ.